This past Homecoming weekend, Oct. 20-22, likely will go down as one of the most exciting times in Pacific's storied history. More than 2,300 alumni, students and parents, faculty and staff, and members of the community gathered throughout the event-filled weekend. The highlight was This. Is. BIG!, a moving interactive multimedia presentation and announcement of the $300 million Leading With Purpose campaign, which will transform the way University of the Pacific provides higher education for generations to come. 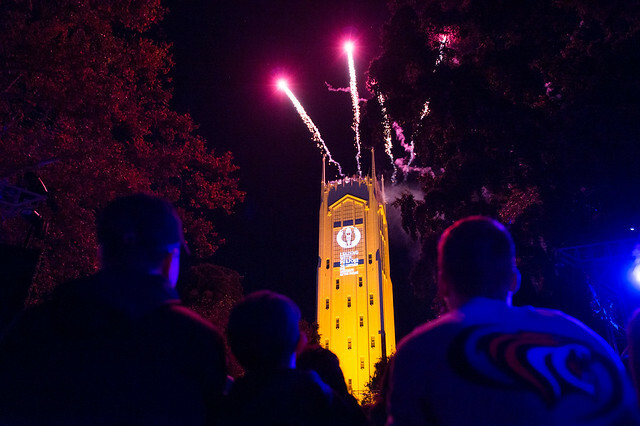 Beginning on Friday with reunion gatherings and athletic competitions, Food Truck Frenzy and Tiger Rally and much more, the energy and anticipation was palpable. The dedication of the Janssen-Lagorio Performance Center on Friday afternoon, a new state-of-the-art training performance center for Pacific athletes, stood out as a tremendous example the impact of philanthropy on the Pacific student experience. The fun continued with an early start Saturday at the 5K Tiger Dash and Cub Run and the Parent Breakfast. Later that morning, Pacific's law, audiology, physical therapy, pharmacy and dental students offered screenings and services to the public at the Students in Action Community Clinics. Momentum continued through the day with various reunion gatherings, including celebrations of the 40th anniversary of the Eberhardt School of Business and the 30th anniversary of the School of International Studies and the All-University Lunch. That afternoon, Pacific's schools, student life programs and University Libraries gave dynamic presentations highlighting the outstanding academic and co-curricular experiences Pacific offers its students at the Discovering Pacific Showcase and afterward in demonstrations during the Taste of Pacific. Then concerts from the Alumni Band — some 200 strong for this weekend — a Pacific Jazz combo and the Pacific Pep Band set the stage for the finale This.Is.BIG! which was punctuated with a colorful fireworks display. Students continued to party with a concert from vocalist H.E.R. and dancing under the stars. It was truly an unforgettable weekend. Relive the memories with our photo gallery! Select the image below to get started.